The wind swept sea. Mermaids, faeries, and Arthurian stories steeped in fantasy and mystery. The stunning Cornish landscape and the beautifully inspired artwork of UK artist Julia Guthrie has left me completely spellbound. I'm sure you're going to find Julia's wonderful artwork and words as enchanting as I did! I loved my 'Big Book of Fairytales' the most, because of the stories but also because I loved the stunning illustrations that accompanied them. Girl's comics were another great favourite of mine...I used to colour in the pictures. This evolved over the years to drawing portraits of my favourite pop stars and copying the posters I had on my wall, or I would copy their album covers with my paints. I recall telling a teacher at school once, that I was going "paint record covers" when asked what I wanted to do as a job. After school I did a year foundation course in Art and Design with a view to moving into Graphic Design. I didn't take that further though and in the last 10 years I have developed my painting skills in a more illustrative direction. MBS: I've noticed that many of the themes in your paintings center around goddess, mythological, and metaphysical subjects. How did this evolve into focal point for your work? Julia: I guess I have always been fascinated by the metaphysical world, and more recently, perhaps the last 15 years or so in particular, I had begun reading a lot more about various religions and their sources. The progression from believing in spirits/ tarot/ psychic abilities, led me to discover a whole new level which really fired up my imagination in a big way, while also becoming a life changing experience. 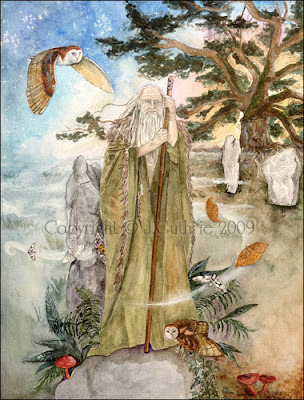 One of my paintings is of a specific spirit guide who has been with me for a number of years. ('The Guide') It is very much how she appears to me. Other paintings on this subject also have deep meaning for me, such as 'Inner Journey' (below). I wanted to express how it feels to be in a guided meditation, as I am a very visual person and I see rich, vivid landscapes which naturally I always wish I could capture onto paper! 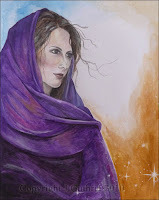 The Goddess paintings, 'Freyja' (above) and 'White Tara' (bottom of page) came at times in my life when I had a very close connection to them in meditation. White Tara in particular had deeply inspired me during a meditation and when I had the idea to paint her it came together so easily that it genuinely felt as though I had channeled the painting straight from Tara herself. When that happens I am as thrilled as anyone to see the image reveal itself. Really I just paint the subjects that touch my life strongly...the parts of life that make me who I am, and my spiritual/ metaphysical side is one of the most important sides for me. MBS: Do you work in a series? Julia: Some work is part of a series, such as the 'Storybook Cornwall' collection, which are illustrations created to reflect my love of books as a child growing up. And as I paint more Goddesses that will be a series of sorts, but there are just as many which are stand alone paintings. 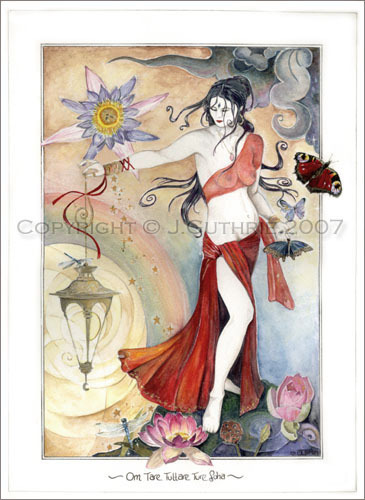 Julia: My most used materials are Watercolour paints, because I like the versatility of them. They can be used lightly or layered for a more vibrant effect. Also pencils and sepia pencils. However I also dabble in Oils and acrylics, and some recent paintings have been worked in mixed media such as acrylic, tissue paper, and gold leaf. MBS: Do you prefer a particular size when you work? Julia: I generally work with A4 and A3 sizes (approx 8x10" - 11x16") as it can take quite a while to complete a watercolour. Larger sizes always sound like fun but by the time I'm halfway through painting I wish I'd done it smaller! MBS: I've read that the inspiration from the visual landscape, legends and lore of where you live has played an important part in your work. Can you explain where you live and how it has influenced you as an artist? 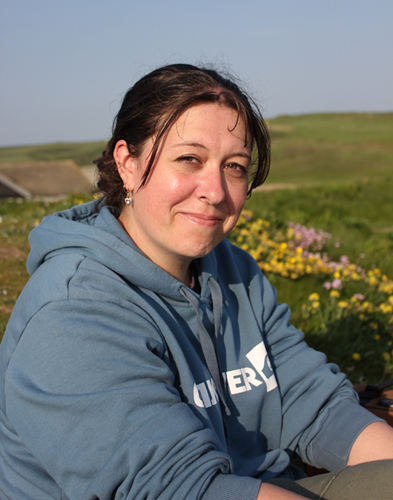 Julia: I am lucky enough to live close to the sea in the beautiful County of Cornwall (UK). On the South West Peninsula you are never more than 16 miles from the coast...which for me, is absolute heaven! I moved here about 16 years ago and fell in love with the Cornish coastline, as many people do! Cornwall is a place steeped in myth and legend, from mermaids, faeries and giants, to numerous Arthurian stories. 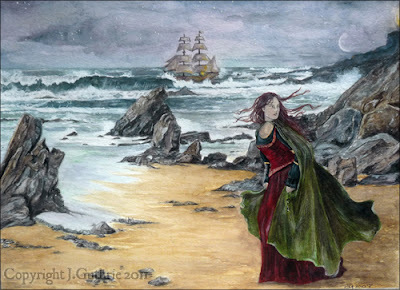 I recall the day I realized that I lived right by the shores of the famous 'lost land of Lyonesse', from the tales of Tristan and Isolde; and I knew then that I had to illustrate these captivating legends. They constantly tug on my heart strings. A few of my earlier works are representative of that, but as my style has improved and changed. They are no longer online to view, but I still intend to capture those tales on paper. I spent 8 years living in Penzance, in a wonderful Victorian town house with distant views of the magical 'St Michael's Mount'. A stunning medieval castle on a tiny island just off the village of Marazion. Looking at something like that each day from my art studio window seat has carved a place in my heart which now forms the basis of much of my artistic inspiration. Living in Cornwall has deeply inspired my creative muse in many ways, and I have also created a number of artworks based on my memories of childhood stories from Enid Blyton's 'Famous Five' and Susan Cooper's 'The Dark is Rising' series'. These illustrations aim to capture the emotion and adventure of secret and magical places, where children can run free with bottles of ginger beer, and solve exciting mysteries! 'Storybook Cornwall' is a series based on my own photographs of places with a story to tell. For much more information on 'my Cornwall', and many of the myths and legends I love, you can visit my blog page. MBS: That sounds absolutely magical! 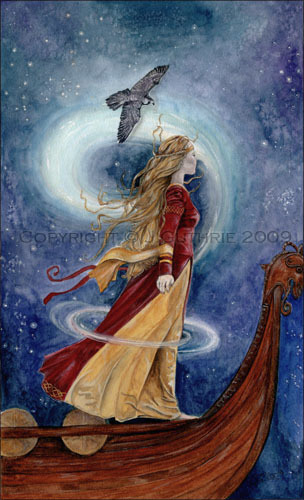 Is there a particular favorite myth or legend from the area that has inspired you? Julia: It really is magical...every time I go for a walk I am reminded of the reasons why I love it here. I am constantly drawn back to the Arthurian legends... probably because I can stand on the windswept cliffs and look out towards the Scilly Isles, picturing the stretch of land that supposedly once connected them to Cornish shores. 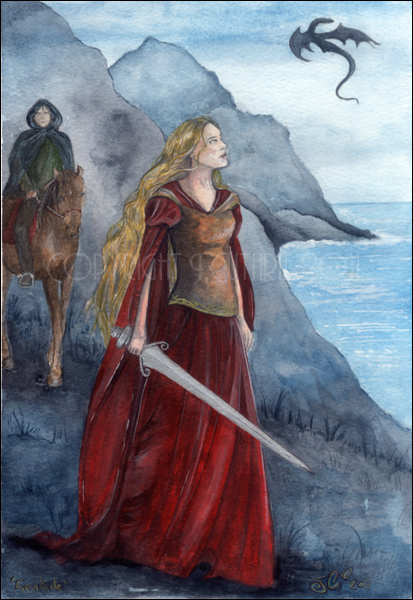 Lyonesse, the home of Tristan, was later apparently wiped out by a huge flood. The Atlantis myth has also been linked to this area because of the similarities. Many tales tell of Cornish fishermen out in their boats, hearing mysterious ghostly church bells ringing out at sea and they say that they have looked down and seen what appeared to be buildings beneath the waves. I also enjoy photography, and while I'm not trained or a professional in any capacity I have a real love of beautiful photographs. I do a lot of paintings based on my own photographs because I simply wouldn't have time to sketch or paint the locations while I'm there. My husband and I do a lot of walking on the beaches and around the countryside, so it's nice to be able to capture an image with all the magical, fairytale atmosphere within in, then take it back to the studio to turn into a painting. My Flickr account houses a vast number of my favourite photographs...some of which have become paintings. For example... 'Riven Tide' is inspired by one of my favourite Pre-Raphaelite paintings by J.W.Waterhouse, 'Miranda the Tempest'. It is based on photographs I took of a nearby cove that has always reminded me of the Waterhouse painting. In 1588 the Spanish Armada was first sighted on this stretch of coast, the beacons were lit and the alarm was raised. It is an era that fascinates me, so I simply had to paint a picture that hinted at such a historic event, happening right on my own doorstep! MBS: What is a typical work day for you? Do you keep a regular schedule to work on your artwork, or are you less scheduled about it? While it is important to keep paperwork up to date and get orders posted quickly, you really have to be flexible when it comes to creating. If I wake up with my muse leaping about excitedly in my head, then that ought to be the first thing I attend to. Later in the day when I have less creative energy is the time for invoices and packing tape. MBS: Do you sell your work online? What has your online experience been like? 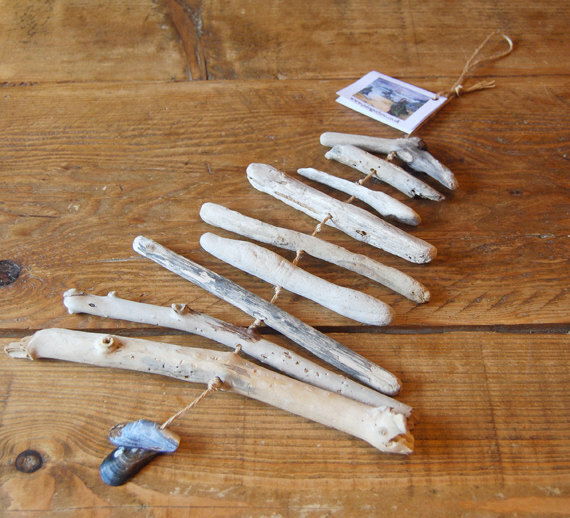 Julia: I have been selling my work online for a few years now and I have found it to be a lot of fun. Through the usual avenues of Twitter, Facebook and Etsy, where I have made many new friends who are both fellow arts and crafters, and customers alike. I have also tried a few other shopping sites which have not quite stood the test of time. Overall it's a lot of work and anyone joining a site like Etsy thinking that 'if you build it they will come', may be in for a surprise as it takes a great deal of self promotion and effort to make it financially worthwhile. Over the years I have gathered a number of loyal customers and 'fans', if I can call them that, while building my online presence the best I can with my website and Facebook page, etc. I am truly grateful to each and every one of them. Nothing makes me happier than when I receive an email from a new person who tells me how much they love a particular painting of mine because it reminds them of a place they used to live...a connection they have to a spiritual deity, or however it resonates with them. That heartwarming connection is what really makes everything worthwhile. Often when I am commissioned to do a painting I will pick up on an idea for a theme, or a particular aspect such as a feather, animal, or a particular type of flower, etc, only to discover that it already has great meaning or significance to the customer. It makes the painting so much more personal for them, and that is very important to me. All my paintings have a symbolic reference to the subject. Whether it's connected to myself or a customer. I also love the fact that my spiritual/psychic side comes into play even while creating artwork. MBS: What are you currently working on? Julia: I currently have a number of projects floating about in my head - as always! 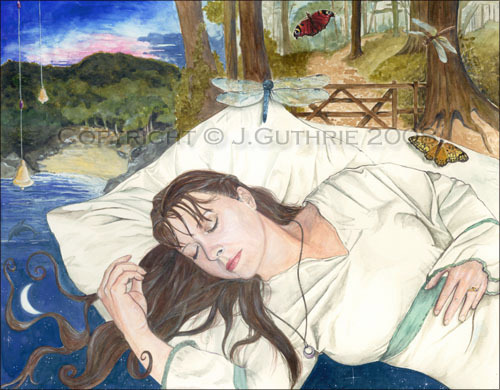 My new work will be based heavily on the Pre-Raphaelite style, as it is what first drew me to art as a child. While I have always been influenced by it, I have long since wanted to move more in that direction with my own work. Aside from the personal work, I have commission work in various forms...from book illustrations, to website banners. MBS: What advice do you have to anyone who wishes to (seriously) pursue an artistic path? Julia: The best advice I could give in the current economical climate, and indeed beyond that, is to paint because you love it! Draw...paint...be creative...try whatever your muse inspires you to try. Always enjoy what you do, and if you aren't enjoying it, do something else. The most successful people I know, whether they are artists, jewellery designers or bakers, are successful because of the love & beautiful energy they infuse into their work. Take the time to learn how to meditate...then work when your muse calls. http://juliaguthrie.blogspot.co.uk/ Blog - to keep up with my life & inspirations! Links to other interviews in the Mind Body Spirit Artist Series. Follow the daily updates of the Mind Body Spirit Marketplace on Facebook and Tumblr. Wonderful insight into the work of a fantastic artist. All of Julia's work is filled with magic, life and love. Thanks for so many beautiful works.